Partition is a violent experience felt by all, not just those in the middle of the gore. Not just then, but also now. In our collective imagination, Partition always comes with its evocative word associations: the year 1947, the sundered lands of Punjab, and, sometimes, the severed halves of Bengal. The words Hyderabad and 1948 do not typically come to mind, but both are as much a part of this historical conflagration we call Partition as any other spasm of violence unleashed at Independence. While colonial-era India is synonymous with the British Raj, much of the subcontinent was not strictly under British territorial control. Instead, there were dozens upon dozens of so-called Princely States, some as small as a single district and others, like Hyderabad, the size of putative provinces. At Independence, these principalities were to choose which state they wanted to ascend to, India or Pakistan, or to become independent states themselves. However, “choose” is a loaded word, given the compulsions of plain geographical boundaries drawn on maps, the political pressures on all sides, and even the coercion of the departing imperialists and their inheritor governments in Delhi and Karachi. After a year of delays and rising tensions that spilled over into violence, Hyderabad chose. In practice, that means on September 12-17, 1948 it was invaded by the Indian government under Jawaharlal Nehru and forcibly annexed to the Indian Union, in a euphemistically named “Police Action” called Operation Polo. In the aftermath of the invasion, up to 40,000 people, most of them Muslim, were killed by a combination of raging mobs and depraved Indian soldiers who sometimes worked in concert. The government-commissioned report that detailed these atrocities was kept under lock and key. It was only declassified in 2013 and its contents were not widely disseminated upon its release. Over the next 30 or so years, the brothers and sisters, cousins and uncles and aunts of my father’s family made their choices as well: abandoning the road to nowhere that was Muslim life in post-colonial, mid-century Hyderabad city for roads with unknown and uncomfortable destinations in the former West and East Pakistan, Dubai, Tehran, and Chicago, to name a few landing sites. This is also a Partition story, but as far as I have been told no one in my family died or had to leave their inter-religious lover or had their experiences, whatever they were, validated in any substantive way. But for an academic researcher’s persistence in pushing for the release of the report, the Indian government would still have us believe there were no experiences to validate. There are many other histories similar to the ones that unfolded in Hyderabad. They are scattered all over the frenetically re-assembling remnants of the newly decolonized subcontinent, from Balochistan in Pakistan, to Kashmir, to the former Travancore in South India. 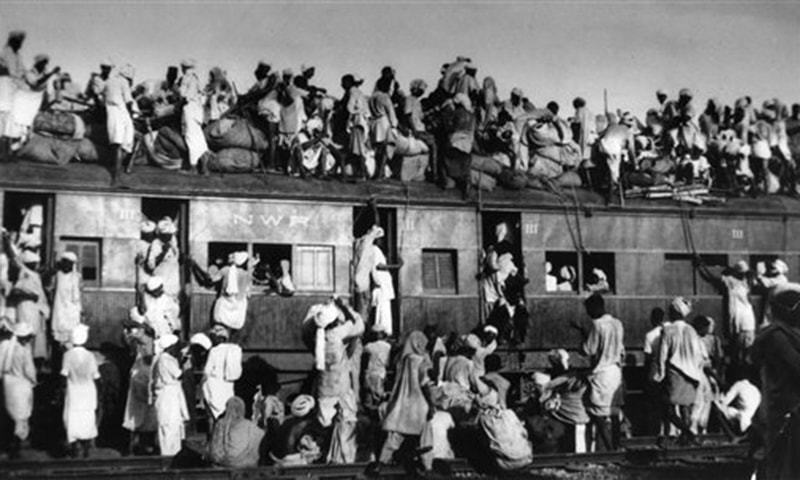 Refugees crowding into a train in New Delhi trying to flee the carnage, September 1947 (AP). The Partition of British India was a cataclysmic event and a human tragedy of unimaginable scale, but it wasn’t just an event. Event conjures up images of finitude, of temporal boundaries, of things that start and end. Partition was a process. The scholar Vazira Fazila-Yacoobali Zamindar argues as much in the aptly named, The Long Partition. She shows that the occurrences that irrevocably rent asunder India and Pakistan (then composed of a West and East wing) took place over a longer time scale than the mass violence of 1947. Crucially, they included more than the physicality of communal clashes. In both countries, governments embodied the violence of bureaucratic procedures in limiting who could legitimately cross the new borders without getting stuck on one side, perhaps forever. Laws were also cleverly utilized to usurp the property of those both the Indian and Pakistani governments deemed “enemies” like the descendant of the Raja of Mahmudabad, who was profiled by the BBC for its Witness series. The remaining Mirzas stay behind in their haveli in Agra, in North India. They immediately begin to feel the ramifications of being a Muslim family–with relatives in Pakistan no less–living in post-Independence India. A government agency called The Custodian of Evacuee Property, an analog of which also existed in Pakistan to usurp the properties of absent Hindus and Sikhs, is in charge of taking possession of property of migrants to Pakistan, hitherto termed “evacuees.” These properties will probably be used to house refugees or go up on sale, or get lost in a morass of corruption. Since the title to the haveli was in Salim Mirza’s brother’s name, once the brother leaves for Pakistan the haveli becomes custodial property. This is despite the fact that the rest of the family is still living there, and despite the fact that they have every intention of staying in India. 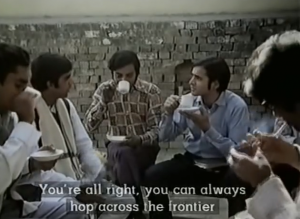 A still from the film Garam Hawa (1973). The Mirzas have no choice but to clear out of the house that has been theirs for generations, because in this world “rules” supersede facts on the ground. On top of withstanding the forces of an uncaring bureaucracy, the post-Partition Muslim comes under strict surveillance. Salim Mirza is put on trial for espionage after mailing blueprints of the haveli to his brother in Pakistan. In another instance, a relative visiting from Pakistan is jailed and deported because he did not report to the police station upon arrival in Agra to register himself. This is a Partition story, too, and only nominally fictionalized. It’s more than very likely that a film could be made highlighting an identical plight of a Hindu or Sikh family in post-Partition Lahore or Karachi or Peshawar. Shanta (Nandita Das) being abducted by the mob in Earth (1998). Courtesy of Film Quarterly. It is not that these stories are unimportant. It is not that a strong focus on the areas most tangibly torn apart by Partition, like Punjab, is unwarranted. But why, 70 years later, have we still remained so invested in this neatly bounded, gruesomely spectacular side of the history of decolonization in the subcontinent? There may be no easy answer. I would say that one of the reasons we continue to perceive Partition in this traditional mode so many decades later is because it serves a powerful purpose: Believing in a historically-bounded moment in which the catastrophic is isolated lets us imagine that it was somehow inevitable through a circular logic of “Look how terrible the violence between different communities was. We could have never co-existed in a single nation and this is proof.” Subsequent history in India, Pakistan, and Bangladesh would spuriously seem to prove this claim. Emphasis on spurious. On the flip side, this sense of inevitability allows for cleansing nostalgia in the form of exploitatively touching Google ads, national anthem crossovers, and paeans to international reconciliation. We can’t go back to more innocent times, but we can pretend we want to. Believing in that encapsulated catastrophe allows those nostalgic efforts to exist asnostalgia to begin with. After all, it is not as hard as it seems to stretch the act of Partition–not even the legacy, but the happening itself–forward into the 1950s as Zamindar does in her book. With a little more imagination, we could stretch it further forward still to the liberation of Bangladesh in 1971. Bangladesh’s Independence was its people’s own kind of exceptionally violent partition as a means to freedom from a colonially exploitative political subordination to West Pakistan. 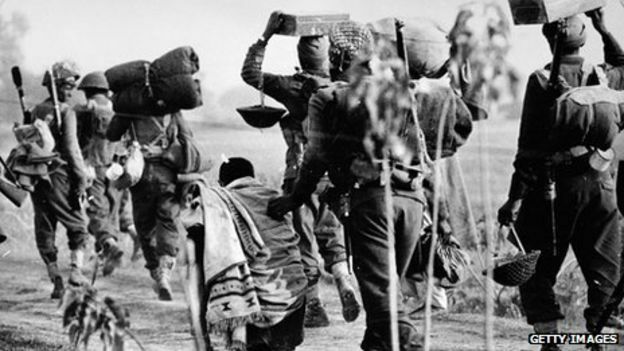 A refugee travels with Indian troops during the Bangladesh Liberation War in 1971. Image courtesy BBC. That’s one example. What would happen if we found our way to new geographies in addition to expanded times? Could we conceptualize the insurgency in the Northeast Indian region of Nagaland, where nationalists actually declared independence from India on August 14, 1947, and its brutal repression by the Indian government, as a decades long Partition in reverse? How useful is the metric of Partition as event to measure history if it obscures more history than it illuminates? But that would ruin the nostalgia. It’s hard to be nostalgic about instance after instance of repressive states, police actions, a feverish investment in territorial integrity no matter how high the body count. You can’t make Google ads about that. This traditional perspective turns Partition into a cause of history rather than an effect of contingencies and political choices. Partition, as we speak of it now, is a neat event defined in its overwhelming messiness. In reality, it is a mess that never cleans itself up. Some try to understand the contemporary waves of violence against minorities across South Asia as a legacy of Partition. If that is the case, we need a better answer to the question of “Why?” than one that claims a rationale in era-defining hatreds and determinations of citizens’ loyalty by virtue of their stated religions. We need to do better than pretend that the process of decolonization in the subcontinent was smooth and logical outside of a little mass murder in a few places, and it doesn’t still haunt us everywhere. What would happen if we expanded our horizons of Partition in time and space? If we dropped it back into a history that contains more than just a few hellish months in 1947? On a personal scale, many more people may discover the Partition stories still hidden in their family histories, people who perhaps thought before of personal stories of migration post-1947 in terms of, for example, emigration for economic reasons alone. The people in my father’s family scattered in many directions and for many reasons, but I wonder where they would be situated if their own little homeland hadn’t been invaded on the pretensions of national unity. No pieces will be put back together. But at least we can try to be more clear-eyed about how they came apart. And we can be more aware of how to care for these dangerous, hot fragments of history left still smoldering in our hands, seven decades later.